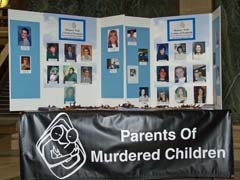 A Capitol observance for Wisconsin&apos;s murder victims. Bill Swanson of Madison leads the Central Wisconsin Chapter of Parents of Murdered Children, and was keynote speaker at a Capitol rotunda observance of the first national Day of Remembrance for Murder Victims. Swanson, whose 26 year old son Daniel was killed in a June 2003 triple homicide in Verona, says society has become too accepting of murder: it&apos;s even in our video games. Families of homicide victims from all over the state attended the ceremony hosted by the state Justice Department&apos;s office of Crime Victims Services .